We didn't actually plan this. Maybe I should lie and say that we did. 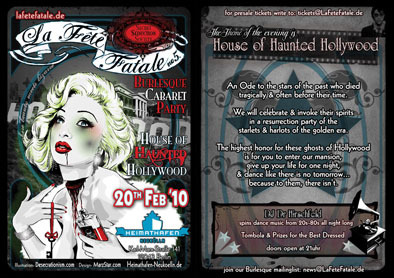 But no, really - it just very serendipitously came about that not only did the latest editions of Dr. Sketchy's Anti Art Berlin and La Fête Fatale end up being planned for the same Saturday (tomorrow, in other words), it just happens to be round number 5 for each of us as well. 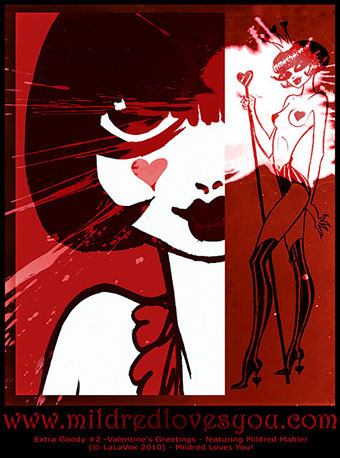 And to celebrate this happy accident The Secret Seduction Society will be offering a 3-Euro discount off the door price for La Fête Fatale no.5 to all of our paying guests at our Dr. Sketchy's afternoon of life-drawing mayhem! We hope you'll join us there! By the way... Sorry about not posting about Dr. Sketchy no.4 yet. It's not because it wasn't wonderful though! We had another fabulously fun afternoon with our models and audience (I'm always on a total high after our drawing sessions together)! I simply haven't had the time to get to it. But I'll be posting about both no.4 + no.5 together then when I return - along with the typical mini-preview of some of the wonderful photos from the photo gallery. Extra Goody #2 - "Valentine's Day Greetings!"